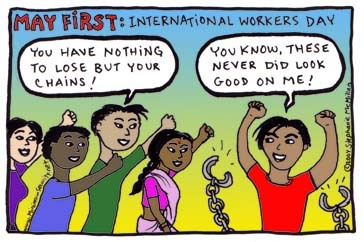 May First is celebrated world-wide as International Workers' Day. Although we were indoctrinated during the Cold War that May Day is some sort of socialist military holiday, May Day is a working class festival day which began in the United States in 1886. May Day is the date when the working class celebrates its international unity and its unity with all the oppressed and exploited of the world, and looks at its long term goal of getting rid of the evil system of capitalism. The class collaborators in positions of power in the US labor movement beginning with Sam Gompers have always hated May Day and have instead gone along with the ruling class in promoting something called "Labor Day" to draw attention away from the international solidarity of the workers and oppressed people. They tell the US workers they have to hate the workers of other lands who are 'stealing their jobs' - Japanese, Mexican, or Chinese. They point the finger for the problems of the system anywhere except at 'their own' capitalists. Take the day and talk to your friends, family and co-workers about how we need a great unity of all the workers together with the other oppressed social groups of all ages and sexes and with the oppressed peoples and nations of the world.